Atlona Technologies presents the all new USB to HDMI adapter, the AT-HDPiX2. This new solution is designed to add a HDMI port to any computer (Mac or PC) and has limitless applications in both consumer and commercial environments. From digital signage to home theater, the all new HDPiX2 provides a simple solution for viewing content from a computer on any HDTV making it the perfect device for any consumer or commercial application. Set up is as simple as plug and play; convenient for any user, no matter the level of technical knowledge. Connect up to 6 AT-HDPiX2s to a PC and up to 4 AT-HDPiXs to a Mac. The HDPiX2 is able to display resolutions up to 1080p or 1600x1200. 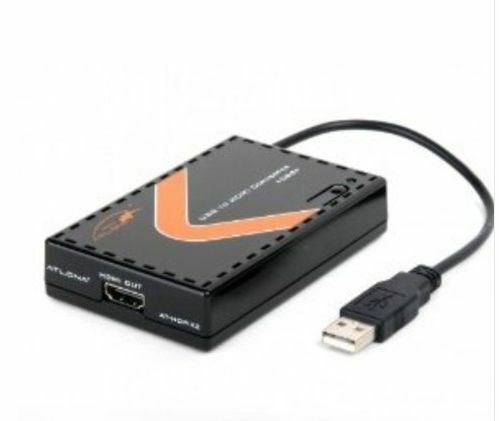 The AT-HDPiX2 also includes a 6 ft. HDMI cable.Audio is supported via the USB connection and is embedded into the HDMI output.